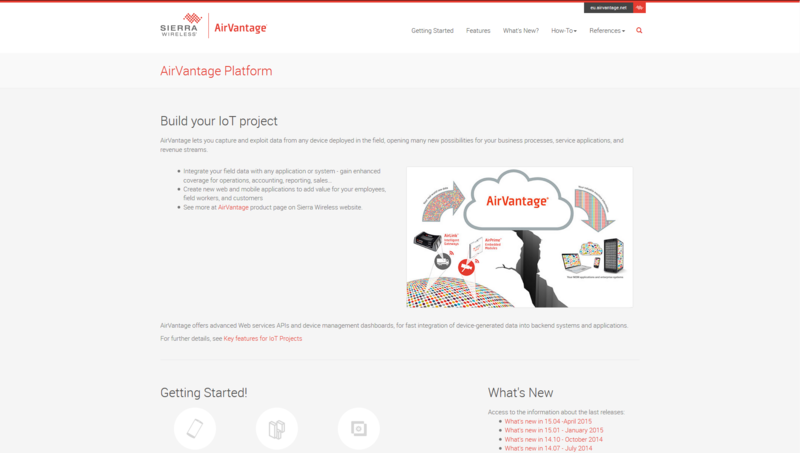 Here are descriptions of some of the most interesting and significant changes made to AirVantage 15.04 for AirVantage Platform. The documentation has been reworked to provide more developer oriented content, including tutorials to connect your devices. QoS 0: The message is delivered at most once, or it may not be delivered at all: this QoS provides the same guarantee as the underlying TCP protocol. QoS 1: The message is always delivered at least once. The server sends back a Publish Acknowledgment to the device. This QoS provides the garantee that your data has been received on AirVantage. A new library has been delivered for all Open AT gateways and modules: SL series, Q series and FX and GL gateways. two samples which send greenhouse data. And if you can’t find a howto for your hardware platform, have a look to the reference guide here! The top section of Monitor/Systems/Grid is now customizable. You can add any widget of your choice or replace the ones already in place, to match a specific use case. 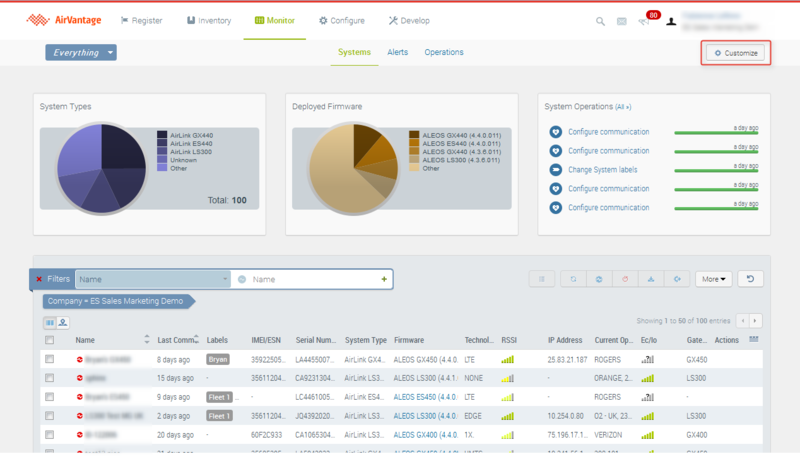 As an example, to upgrade your fleet, you can pick the System Types and Deployed Firmware widget. This will permit to easily select a subset of the fleet with a specific version and upgrade, and then select another part and upgrade it without going back and forth to the start page dashboard. Note that you can add more than 3 widgets, still this will push the grid down to the bottom. 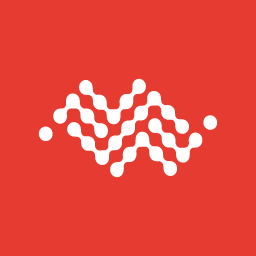 AV Phone: you can go on the google or Apple Store to download the AV Phone application on your smartphone and use it to simulate a machine and send data to AirVantage. New modules: MC7354 and variants have been added. SL8082BTAR and HL6 are not BETA anymore. Adds automatically a label when launching an operation on more than 100 entities. Then the label is now automatically removed. From the system details, we not only provide a direct access to AceManager to the default connection port 9191, but now you can also benefit from the same functionality if you are using SSL or if you changed the default port. 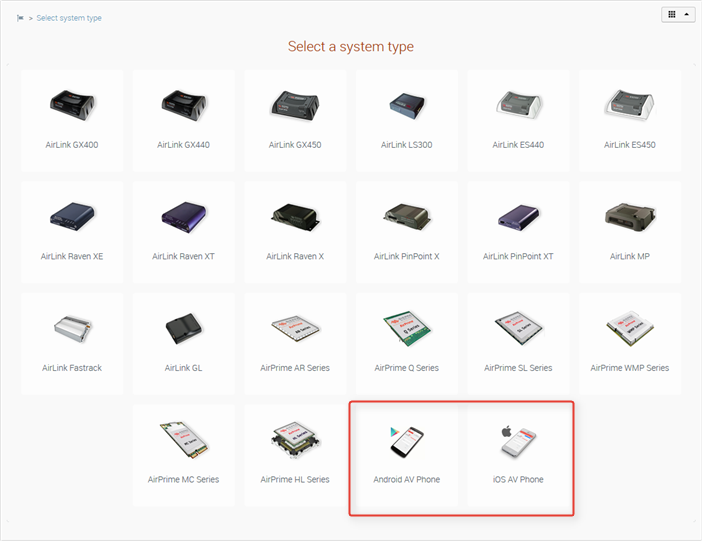 AirVantage will deduct the way to access AceManager from the device configuration.